1. Cozy & Soft Shorts: these super cute and comfy shorts are great for sleep, workouts or just lounging around in in the summer. They come in four colors and they're $22! They're great to bring on a beach trip (or any other trip!) to lounge around in during some down-time. 2. Gold Disk Earrings: if you're looking for a cute pair of earrings that are lightweight and affordable - here you go! These are $15 and remind me of a sand dollar, so summery and fun! 3. White Tassel Espadrilles: I was so excited to see these included in the sale! I tried them on in-store last week and they fit TTS. They come in peach as well and are just under $50. 4. Square Tortoise Sunnies: the square sunglasses trend is my favorite of all trendy sunglass shapes right now. These are only $56 and aren't too big, but are the perfect size for most face shapes. You'll wear these a ton! 5. COOLA Sunscreen Spray Set: I'm very picky about sunscreen because I want something I know I can count on when it comes to SPF. I started trying out the COOLA sprays this summer and I love them! I was so excited to see them a part of this sale - if you haven't tried them, this value pack is worth every penny! 6. Origins Skincare Set: out of all the great beauty buys during this year's sale, I think this has to be the best one! It has a cleanser, moisturizer, mask and more and it's only $35! The tube sizes are perfect to travel with and a value pack is a great way to try out some new skincare finds before committing to a bigger, more expensive sized bottle(s). 7. White Peplum Tee: such a great basic - wear it with shorts, jeans or over a swimsuit! It has a great fit and this is something you'll wear all the time and can layer later on in the year too. 8. Tory Burch Crossbody: I can't believe this is still in stock! It's described as a "wallet crossbody" but in person it's really a perfect sized crossbody bag. My favorite is the navy but the cognac is such a classic! It's such a great price and definitely worth buying. It's easy to pack and perfect to travel with! 9. Cognac Tory Burch Sandals: so different than most sandals and for Tory Burch shoes, surprisingly comfortable! Love the gold detailing and that they're a bit of a dressed up flip flop/sandal. 10. Pink Jumpsuit: for $38, you can't pass up this jumpsuit! It's elegant and can be dressed up for dinner or worn a bit more casually - the wide leg is so different and fun! 11. Kendra Scott Hoop Earrings: such a fun take on regular hoops - and it isn't every day that new Kendra pieces are on sale, take advantage of these! 12. Bumble and Bumble Summer Hair Set: summer hair is not the easiest to manage, especially if you have curls and are in the heat! Hah! This Bumble and Bumble set are all travel sized styling tools (heat free - perfect for the summer) that you can take with you on a trip or weekend getaway. 13. St. Tropez Self-Tan Mousse: out of all of the St. Tropez products, this mousse is one of my favorites and everyone else's, too! It gives you a quick, easy and flawless tan that leaves you glowing without being too dark. So exciting to see this on sale! 14. 'Good Vibes' Tee: how could you not have good vibes in this comfy, simple tee? Pair it with denim shorts on a hot day or tucked into a skirt for a dinner or night out. For $21, you can't pass it up! 15. White Nike Sneakers: these are another sale find that are shockingly still in stock! They're the cutest white sneakers and are beyond comfortable. You will seriously live in these. 16. Colorful Drop Earrings: a fun, bright accessory that'll make any outfit pop this season! Need that good vibes tee, pronto!!! Obsessed with this sale! OMG the Tory bags in the sale- LOVE!!! I wasn't able to make that type of splurge this year but they're so cute. My clothing items I got just arrived! So many cute things! The jumpsuit is my fav! Love your picks! My favorites are the peplum white tee and the crossover bag! These are some cute items! I really love those espadrilles. They look adorable! Such beautiful selection, i dont have the nordstorm card because i am afraid to have too much credit debt hahahah!! 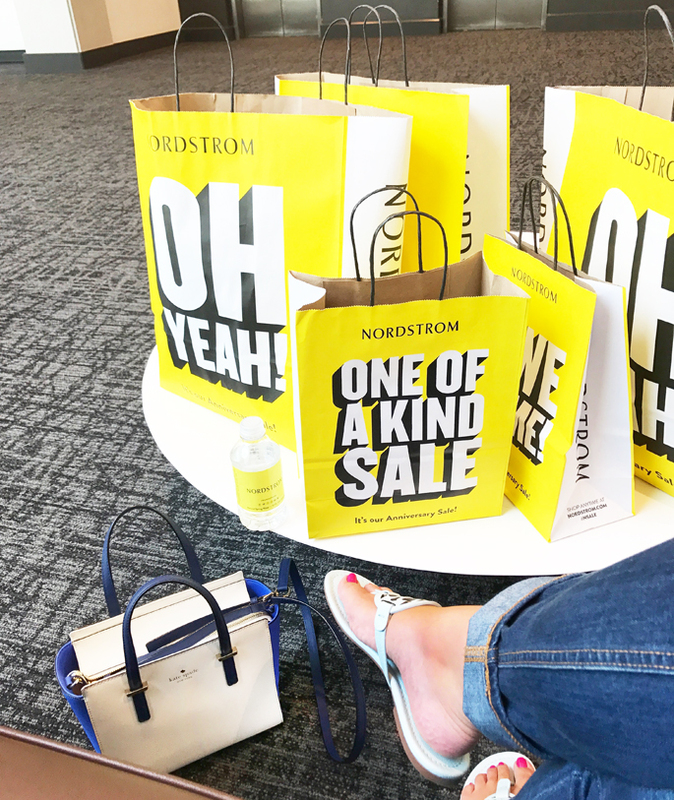 The Nordstrom Anniversary Sale is so much fun!!! Love the bag :) What a cute collection!!! Thanks for sharing. Ooo! Sooo many goodies -- love it! I'm obsessing over the Tori Burch crossbody, for sure! There are too many cute things to choose from during this sale! It's hard to decide whether I want to get more things for the hot summer to wear now, or if I want to get a bunch of autumn clothes to wear in a few months! So many good goodies!! So good to have a selection to shop at Nordstrom Sale. Oh my gosh, that shirt is a total need for me! How cute! SO agree on the Coola sunscreen, too! I love that first pair of shorts, especially in that color! So pretty! I love that white tee- so cute and versatile! Origins skincare is always a must for me! OK that pink jumpsuit is adorable! What a fun piece! oh whoa! I gotta check out their website asap! nothing is better than a good sale season! The pink jumpsuit and Tory Burch sandals are cute! There isn't a Nordstrom near me, but I'm going to check out their website now. Thanks for sharing!! I love all your picks! My roommate grabbed that jumpsuit but in the lilac color, so cute! These are all so cute!! I just bought the good vibes tee, love it!! Love your picks! That jumpsuit is so pretty and stylish! I love Coola suncare too! Loving all of these picks A! I love that TB bag (you knew that already lol), and the jumpsuit is cute too! These are all such great picks! I love that jumpsuit! I love that everyone's picks are slightly different, but always classy and fabulous! I'm in love with the espadrilles and coral jumpsuit! On my fourth order I finally talked myself into the Nikes and I am so excited for them to arrive! I think my faves from this list, are the shorts, the good vibes shirt, the shoes, and the earrings!! There are such cute items on sale this year! I totally use this sale to shop for my fall wardrobe! The sale is so good this year! I'm eyeing that Tory bag! I did all my shopping online since I don't have a Nordstrom in my state. Love that jumpsuit! These are all great pics! I've been loving Coola tan lately. That's a great skincare set! I love Origins line! great picks! i love origins so much - always a great product! I love your picks, girl! Definitely need to add that TB crossbody and that cute tee to my closet! I am so excited for the sale. I can't wait for my order to arrive. Oh I love all your picks! That good vibes tee is perfect though as it can be worn right into fall with a chunky cardigan too! !